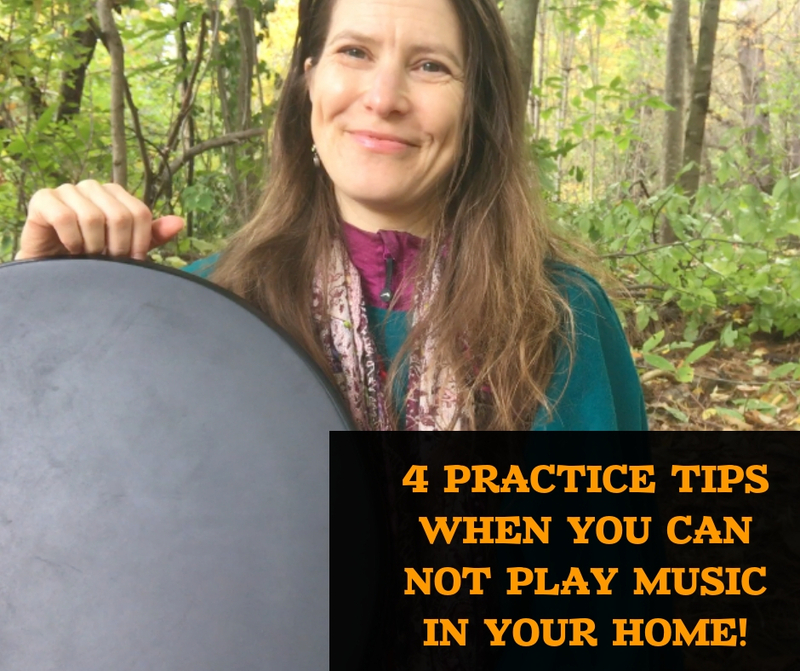 4 Ways to Practice Music when you can not play in your home! Recently, while I was on tour, I had a period, (3 weeks to be exact,), where I could not practice in the apartment I was staying in. Mind you, I play frame drums, they are not “loud”, but apparently, the neighbor upstairs thinks they are. I had carved out some time in my schedule to “practice” for a few weeks. When I found out that I could not even lightly play my drum, I first go furious!!! But then… after a long bath, (or two), I realized there is so much that can be practiced WITHOUT a drum. Now I know this sounds crazy, how can one practice without actually putting their hands on an instrument, but please read on and I will happily share more about my experience..
1 – USE YOUR VOICE & RECITE! If you can not drum, the second best thing is to recite rhythms (or songs)! Whether you play an instrument or sing, you can recite the grooves or melody. For a deeper practice experience, you can put your metronome on and sing/recite along with that. To your neighbors who complain about sound, it will sound like you are talking on the phone! I also like taking walks and reciting my grooves that way.. get the blood pumping and heart in sync with the grooves..
2 – DRUM ON YOUR BODY! Ever heard of Body Percussion? I believe body percussion was the FIRST INSTRUMENT! Think about when we were babies, and our parents patted our backs to sooth us when we were coughing..
Our bodies are always there for us. 4- Then, finally, tap your foot to a third rhythm! And also notice how the pitches change between each groove you play! I have always loved body percussion, but this time when I could not physically put my hands on the drum, re-awoke me to how FUN (& Beneficial) Body Percussion is! Am I getting spiritual on you? Great masters have shared how powerful the tools of meditation and visualization are. I spent time daily – visualizing myself drumming – practicing rhythms – playing songs – sometimes I also recited the grooves outloud, and sometimes I just kept quiet. Now, of course, there is NOTHING like putting your hands on skinds (or fiberskin) drums – and enjoying the deep, resonate tambours.. But, it did feel pretty nourishing to imagine, visualize and meditate on drumming. *this one is my favorite! Another great time is to practice with a blanket over your drum! The “DRUM ON BLANKET (DOB)” Technique really works! Put a blanket over your drum and play, its that simple! Make sure the blank covers the full head of the drum. I also like the sound that it creates, a more dampened, ethereal sound. ALL EXPERIENCES HAPPEN FOR REASONS! At first, I was raging mad that I could not drum in my apartment. But, I turned this lemon attitude, into a nice fine chocolate sufflet, but seeking alternative ways to experience the magic of drumming, without physically drumming. Ill admit, it was frustrating at first, but once I figured out these four key elements that worked, it became an adventure..TRY IT! The next time you find yourself in a location where you can not practice, please try these four fun technique’s.. they really do work! *If this blog inspired you, please feel free to share with your friends.